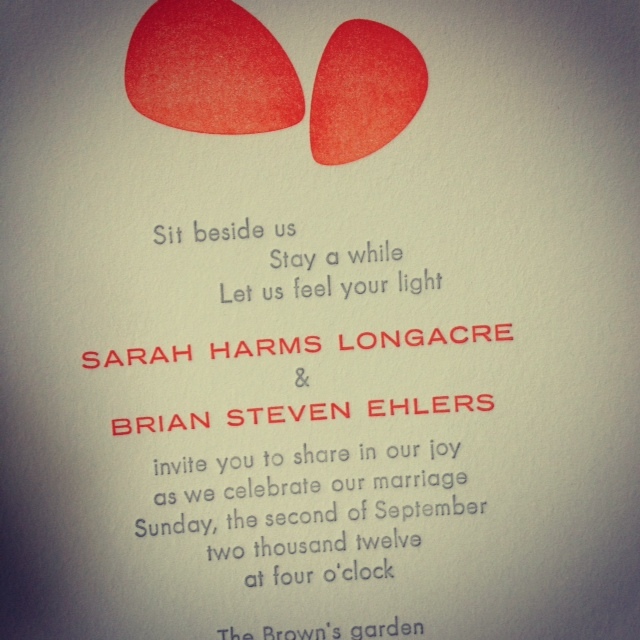 My little sis is getting married this Sunday (YAHOO!! ), as well as my dear college friend this fall (you go Jen!) so I’ve had weddings on the brain as of late. You know the best part about weddings these days? 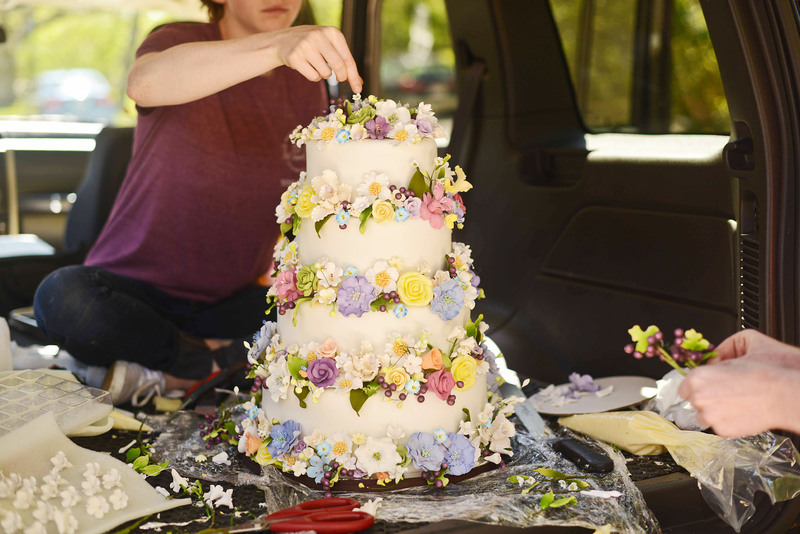 You can plan whatever you’d like – and there are many creative folks who are bringing a new energy to the big day with the addition of handwriting and sentimental touches. 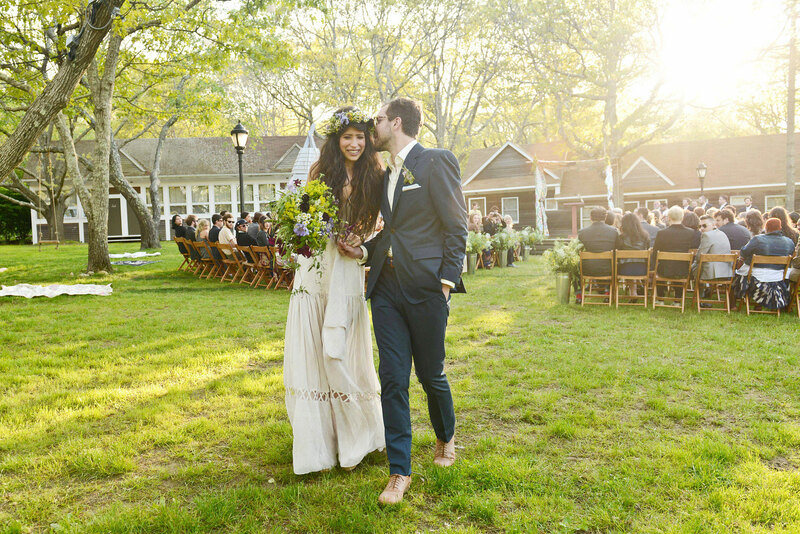 This lovely country, free-spirited wedding was featured in a recent Vogue and it seems to be showing up on many blogs these days. 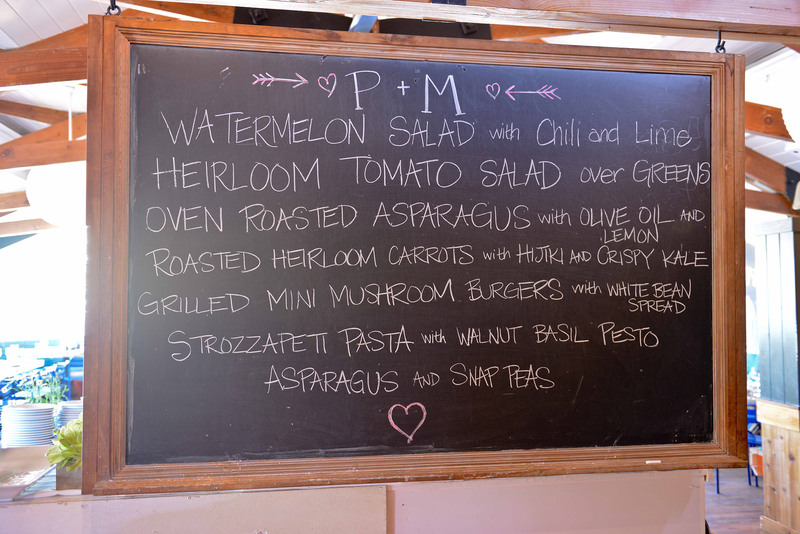 In Montauk, the jewelry designer Pamela Love, and her partner created a personal feel to their day with a handwritten welcome sign and menu. 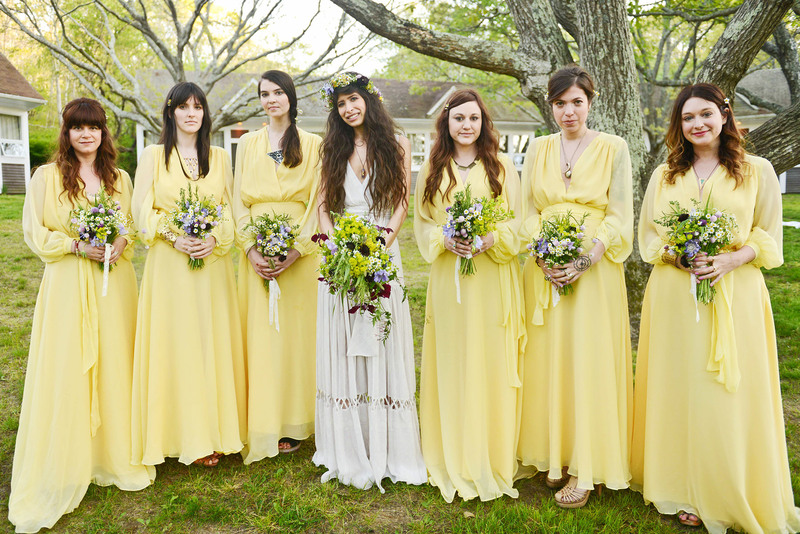 Aside from the uber hippie bridesmaids (LOL), I appreciate the simplicity and homemade spirit to the event. This wedding in Joshua Tree was all about personal touch. 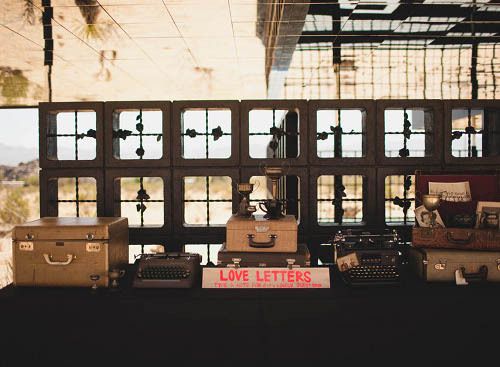 The couple even provided typewriters to create love letters for the newlyweds! Of course, what kicks off these events are the invitations. The folks at Stationery Trends magazine feel the bridal market trend is to be both edgy and classic. With the former, people are either creating their own invitations (who has the time for this??) or finding a calligraphy or font that appear handwritten or handcrafted. Folksiness is hot! 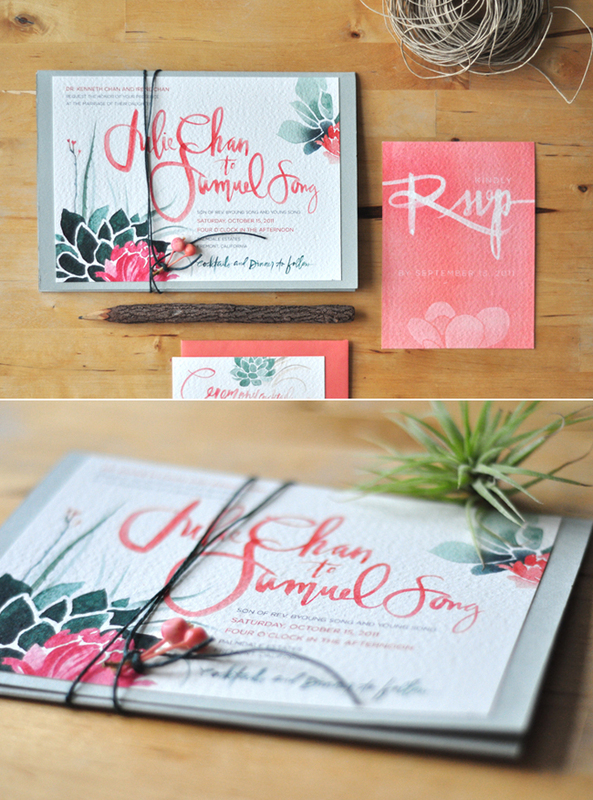 Graphic designer and illustrator, Julie Song, created her own wedding invite by mixing watercolor details, different type style and garden details. The cursive painted names are just lovely. 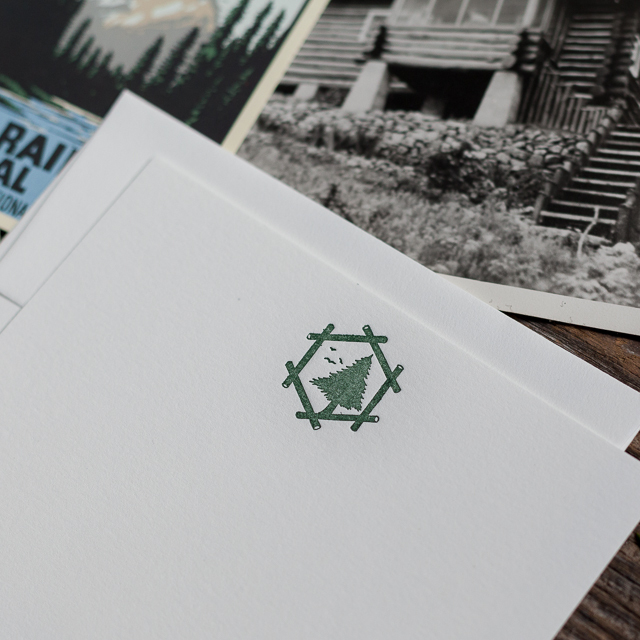 Of course, if you are moving towards the Classic trend, letterpress is all the rage. 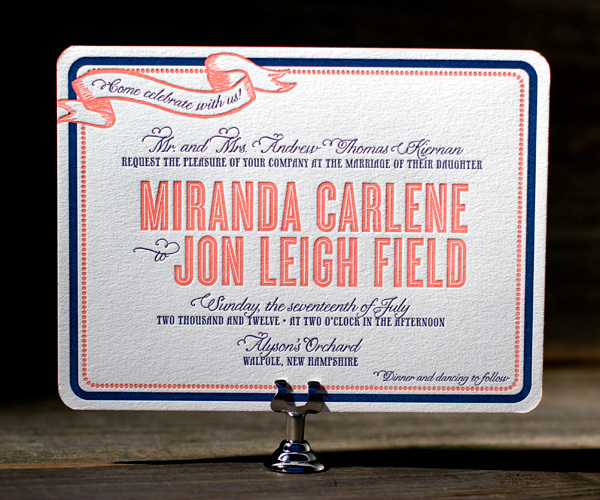 Here, Bella Figura has combined print and handwriting into their popular Country invitation. For Sarah & Brian’s wedding this weekend, our talented friend Jean (whom I featured here) created a look which works well with the reception location at The Walker Art Center. Artsy but still personal. 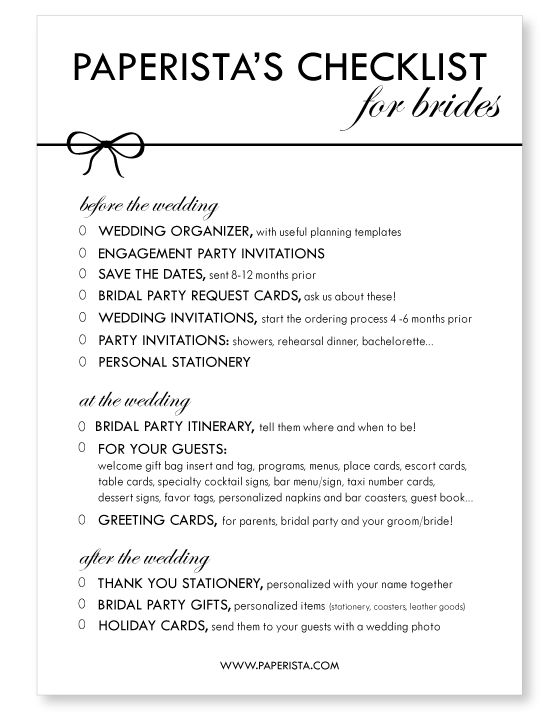 For the bride who is in need of a bit of direction, Paperista has you covered. 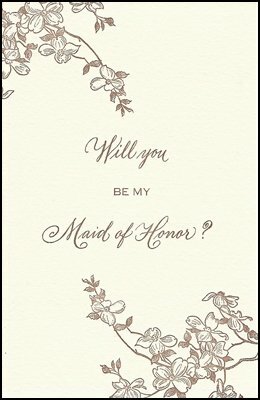 Last week I stopped into the store and found these classic cards for the wedding party from Tallu-lah. They think of everything these days. 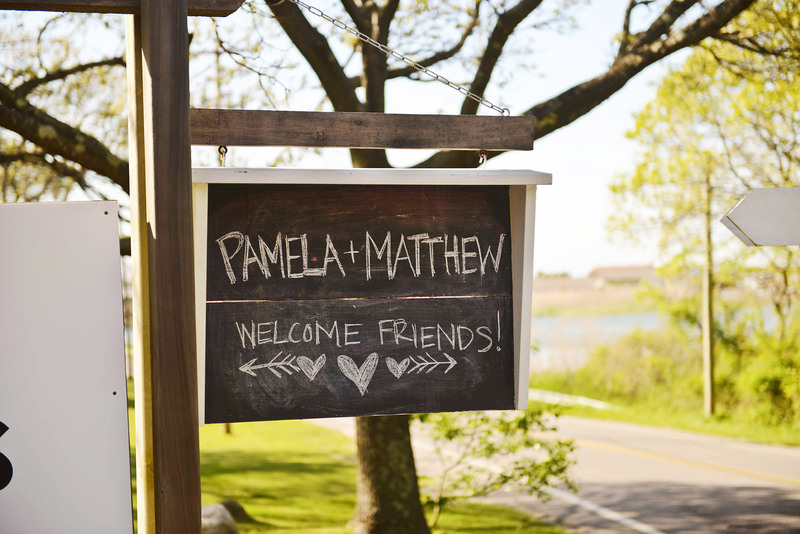 Of course, you can find handwriting in some unconventional spots during a wedding. Our friends, Gail and Phil, dug up a memento from their wedding night. Just before Phil’s brother was to give his toast, he decided the bathroom was the best place to gather his thoughts. 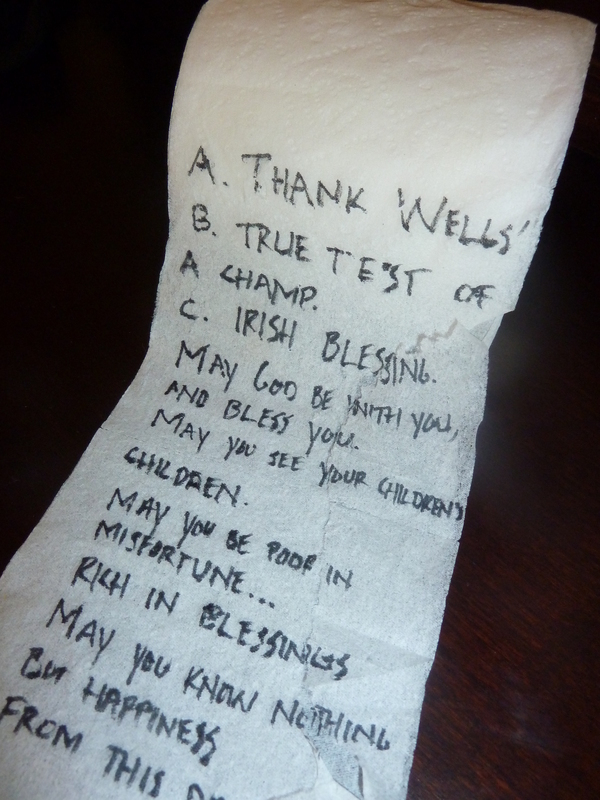 Thus, a handwritten note on toilet paper. Classic (even at the Minikahda Club). I’m hoping to finish a handwritten toast for this Sunday night’s festivities prior to the event. I’ll be spending plenty of time nursing Bea in the bathroom so I just need to remember to pack a pen in the diaper bag! It’s always a thrill when someone directs me toward an individual who is making a difference through handwriting. Thanks JD for sending me such a great one! When you have an extra 5 minutes take a listen to Hannah Brencher, a woman who is changing lives through the power of a love letter. If you want to read more about Hannah’s story or are interested in writing a love letter to a someone in need, check out her site. As she stated “I’ve discovered that no matter how tough we act, we all still need a love letter from time to time. 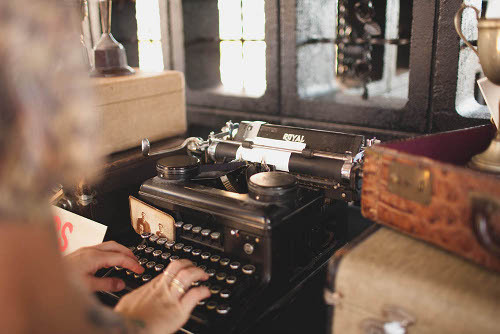 That even in a world crammed tight into 140 characters and constant status updates, there is a still a great craving for the handwritten note.” This gal is a keeper. We returned this past weekend after two weeks out on the coast of Oregon. A wonderful get away for the Brown family 5. After a few days of settling in I’ve been itching to push the pile of bills, letters, pictures and the like aside for a brief moment to share a few ‘brown ink‘ surprises found during our stay. The first week a few members of the Seattle Brown family visited us, one of them being 18-year-old Evelyn. 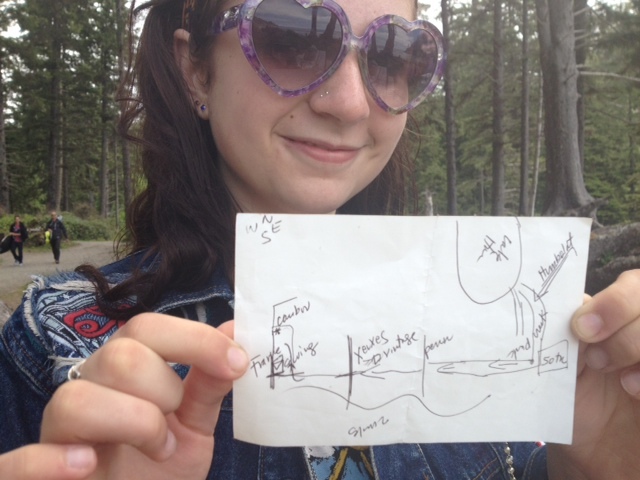 On our return from Surfer’s Beach she dug in her wallet and pulled out written directions I wrote for her last summer while visiting us in Mpls. 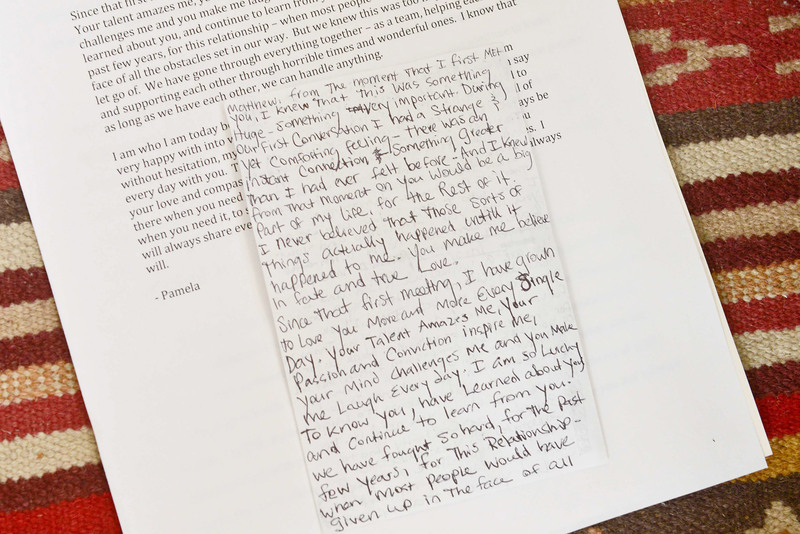 Evelyn had held on to the note because it “was a great memory” and she also appreciates the value of a written note. Thanks College Girl! Hope it lasts through your first semester. Everyday on the beach we find ourselves digging in the sand, looking for sand dollars or other hidden treasures. But this one was a surprise. 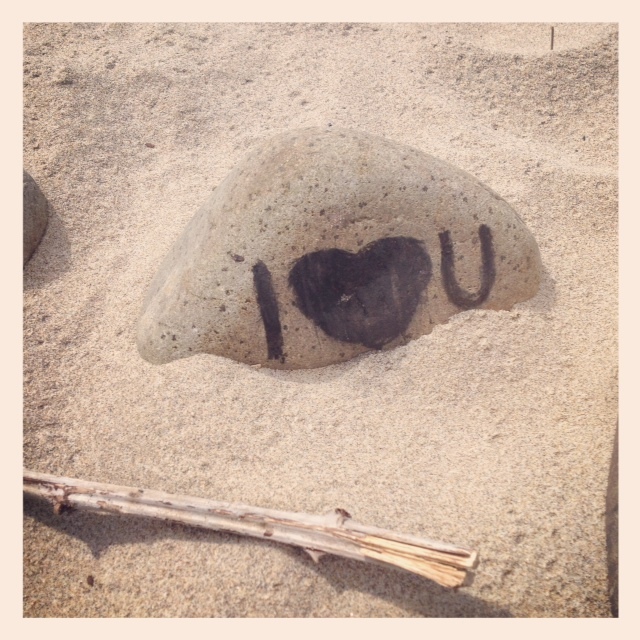 A part of beach fire pit, we found this gem. Maybe there’s a future in rock writing? Every Friday night in the summer in our small coastal town, Manzanita, the locals run a Farmer’s Market which is filled with a few dozen stands of produce, homemade pies, berries, organic soap, cheeses – you get the picture. It’s definitely our favorite night of the week. 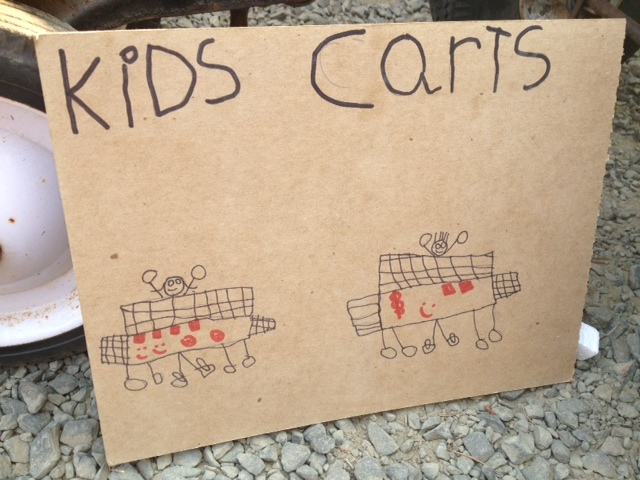 One addition to the stands this year was the Kids Cart. Emmett had noticed the children, about his age, selling a variation of products and urge the family to check it out. So after I inhaled my kale/strawberry/apple/beet blended juice and the boys licked their banana & nutella crepe plates clean, we chatted with the young crew. These kids were all business. 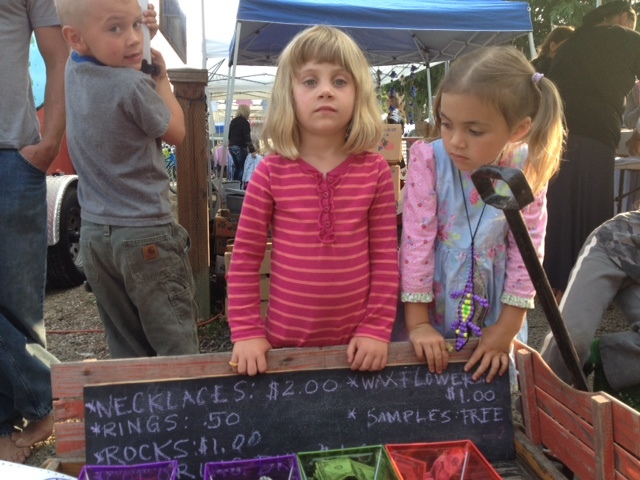 Although the two young girls were a quiet duo, they were making the big sales (rocks for $1.00 is a steal these days) and had already sold out of their necklaces an hour into the market. However, darling young Otto was the one who took my breath away. Not only did he sell handmade coloring books and Ninja figures but he also was selling…yes, you guessed it, greeting cards. My heart just melted. I wanted to buy them all but restrained myself and walked away with just a couple for a few lucky recipients. It was obvious Otto felt extremely proud of his work. And why shouldn’t he. He just might be on to something. 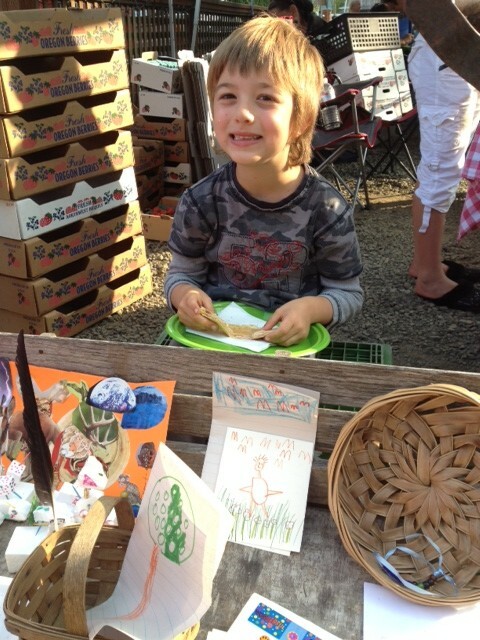 With summer nearing its end, why not create a Kids Cart to sell handmade goods versus the expected lemonade? Let the kids’ creative spirit fly. It will leave a lasting impression on them as well as the passersby. In about two weeks it will be the 13th anniversary of the first, and last, time I failed to mark my wife’s birthday in a timely manner and with the proper fanfare, (any fanfare for that matter), such a day deserves. 13 years ago we’d been dating for a little more than a year and had recently moved in together. Her birthday was on a Tuesday and back then we ran – frequently together – quite a bit, so pretty early that morning we were on the front steps lacing up our shoes. The sun was coming up, the birds were chirping and all seemed right and just in the world. But Wendy’s a pretty easy read and it didn’t take long to see that while everything around us was in alignment, something was rotten in Denmark. What I didn’t know then, but really, really know now, is that Wendy and her family take birthdays very seriously and hold them on the same latitude as more traditional holidays like Thanksgiving and Father’s Day. Fair to say I haven’t made that mistake again. The point is not to relive an uncomfortable memory which today most of us can laugh about or to remind me that I used to run before work, rather, it’s that this episode could have been easily averted if I’d thought ahead, bought a simple blank card at Burch’s, and written a short birthday bon mot to honor the occasion. Easy, peasy, lemon squeezy. Chocolates and diamonds are the easy way out and don’t communicate thoughtfulness or soul, whereas a heartfelt card is usually all it takes, and can be the best, most honest way to convey your love, admiration, gratitude, or whatever message you’re trying to get across. So get a card, write from the gut, and be done with it. That said, for our first Christmas together I bought Wendy a carry-on rollaboard suitcase which we still use. A story for another post perhaps. Every summer we head to the Oregon coast where we rent a house on the beach for a week. And at the end of our stay I make sure to share some of our memories in the house’s Guest Journal. I page through the past entries, noticing how other guests have spent their time while staying at the Neahkanie Treasure and also looking back at our first years on the beach when our boys were just babies. There is usually some kind of consistency…sand castle making, wine consuming, relaxation. 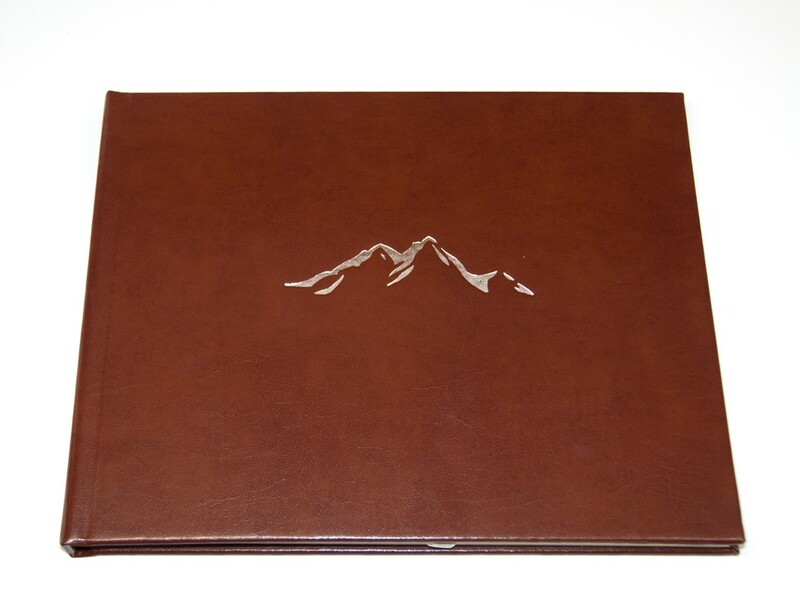 Either way, the journal welcomes us in each year and keeps our memories in a safe place. Looking back, ever since college I’ve had a thing for Guest Books. My freshman year roommate and dear friend, Dana, would drag me (though I never fought) to Milwaukee for the weekends to enjoy a home-cooked meal and clean sheets at her mother’s home. I recall the first visit when I was struck by a Guest Book sitting on a bureau in their entry way. Where was I? An inn on Cape Cod? Kim, her mom, was not running any sort of B & B but she always made you feel welcomed and your presence was appreciated. The Guest Book was an extension to this authentic greeting. 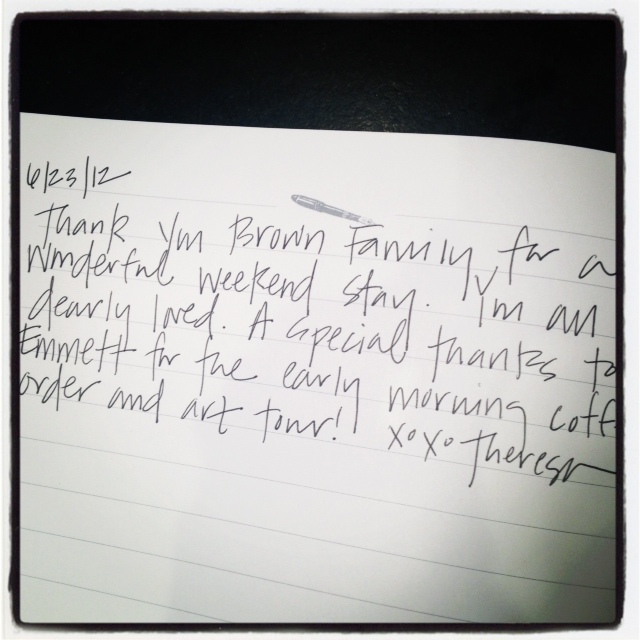 I felt like a wanted, celebrated guest through documenting my time in their home with my own writing. So lately I’ve been thinking, why not purchase a Guest Book for our friends and family to sign when they come to stay with us? Not only will it remind me of who visited over the years but hopefully it will provide the same welcome feeling I received in Milwaukee on those chilly Wisconsin nights. With one of my childhood friends, Theresa, arriving from Des Moines to enjoy a girls’ weekend last month, I quickly purchased a Guest Book from faithful Paper Source. And thus begins the documentation of visitors at the Brown’s home for hopefully years to come. If this intrigues you to find one for your own home, look no further. 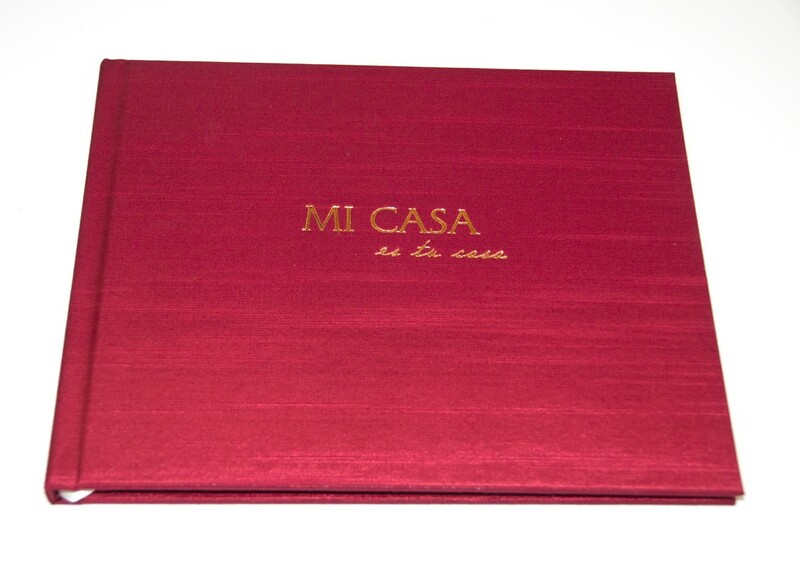 You can match the style and color of your home with this satin, rayon or leather Mi Casa Home Guest Book and personalize it with your family’s name. I found this Guest Book to be simply odd. 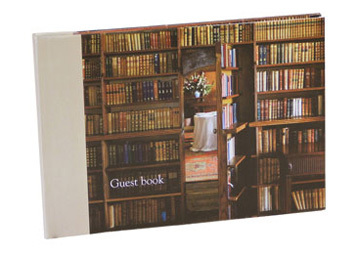 I suppose if you are a lover of books this guest journal might suit your home quite well. This one reminds me of some kind of Bavarian Inn but it sure has warmth. 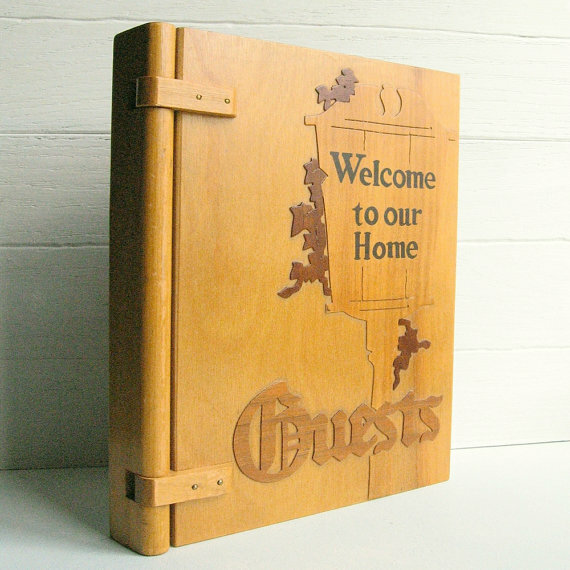 And of course for those of you who enjoy a second home up north, a welcoming Cabin Guest Book is a must. 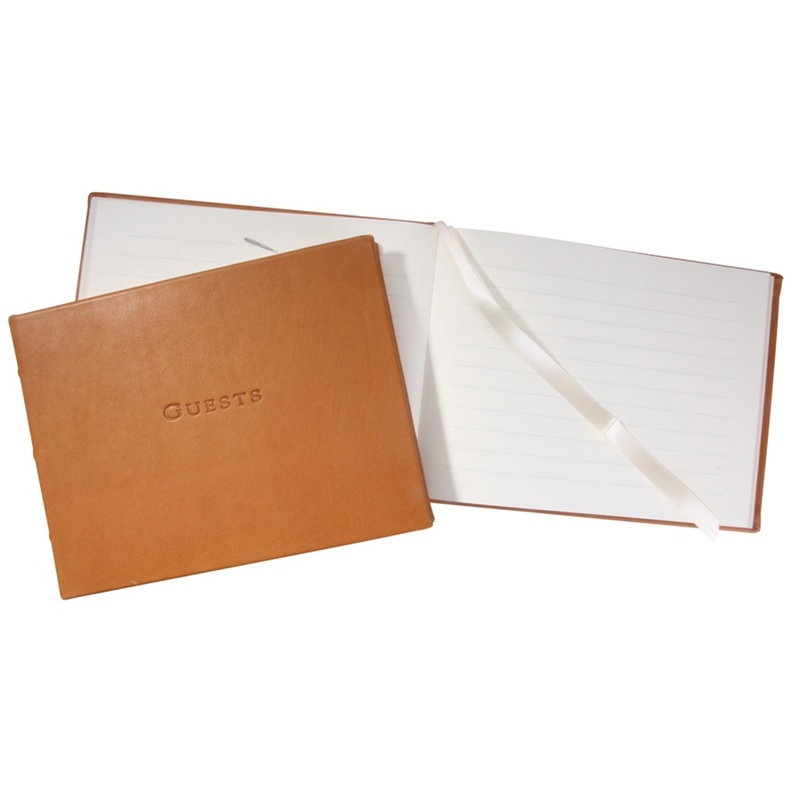 Then again, a lovely generic journal is just as acceptable as any of these traditional Guest Books. 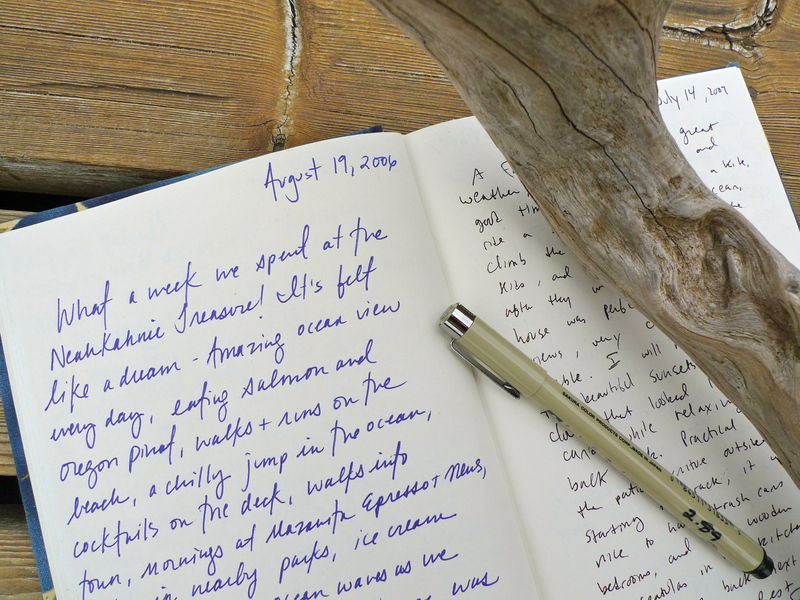 At the end of the day, your guests’ own personal mark will hold the greatest meaning no matter what form the journal comes in. The ink cannot be replaced (neither can the memory of your kids waking your guests up at 5:45AM!! ).